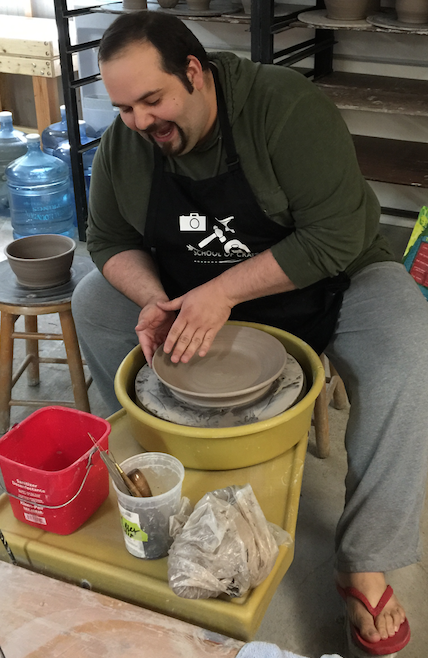 This month, we sat down with The Growing Stage: The Children's Theatre of New Jersey's Audience Development Director, Danny Campos to hear a bit more about his newfound love and appreciation of pottery. Danny went on a weekend retreat at Peter's Valley School of Craft, where this passion was born. What interested you about pottery? Well, I've always been a crafty person growing up (before theatre, art class was always one of my favorite classes in school), so I've always enjoying doing some type of arts and crafts as a kid whether it was painting or putting together an amazing presentation for the Science Fair -- glue sticks, construction paper, and scissors were my school supplies of choice. Share a bit about your retreat experience at Peters Valley School of Craft. What did the weekend consist of? I like to refer to it as Summer Camp for Artists. I spent 3 days on their beautiful campus in Layton, living in an adorable farmhouse nestled near the Delaware Water Gap. Each morning I'd get up have breakfast at the dining hall and then head to the ceramics studio to begin. We'd take a break for lunch and then return back to the studio to work till about 4 or 5PM. After that, we'd have dinner and then your evening was free to go back to the studio, which was open all night or hang out with the other artists. It was a fun experience, but a great deal of work too. The group was mixed from all over the country—you had experienced Ceramics artists, some who have dabbled in it a few times and then novices like me. The most enriching part of the experience, was everyone was treated the same. Kristen Muller (Executive Director of Peters Valley) made everyone feel that they were accomplished artists in this medium, which lead to a relaxed, but focused environment where we were able to put our best work and ideas forward. Since this class focused on the wheel, one of the most interesting things I learned was how important consistency really is to the overall piece. I think going into this class, my only connection (and it’s VERY cliché) to pottery on the wheel was Patrick Swayze and Demi Moore in Ghost. Well, I can tell you it’s a lot harder (and maybe not as romantic). What kind of pieces have you created and which is your favorite? At Peters Valley, I created lots of fun bowls, vases and a plate, but my favorite piece is my HUGE mug because I love coffee and its size will definitely satisfy my daily fix of caffeine. Since your weekend retreat at Peters Valley, have you created pottery at any other place? I have not done anything like the retreat at Peters Valley, but I’ve taken a few 2 hour workshops here and there. I actually celebrated my birthday this past year with my friends at Mud & Soul Clay Studio in Fairfield. We created these cylinder lanterns, then had them painted and fired up. Plus the workshop allowed us to bring in wine and cheese to help celebrate the occasion. I definitely create my best artwork with wine and cheese. Any upcoming pottery events on your calendar? As of right now, no pottery events, but I'm looking to return back to Peters Valley for another weekend intensive. I LOVE it there! How do you think pottery relates to theatre? Well, I think it’s all the same, just a different art form. The ceramic studio was my theatre for the week and the pottery wheel was my stage. My hands served as a director creating and modeling a piece of art ultimately bringing it to life. By the end of the 3 day intensive weekend, I had 14 pieces ready to be “fired up.” If I was there longer, I would apply the next steps---the “icing on the cake”-- some colors as if I was the lighting designer or costume designer, ultimately putting the final touches on a finished product ready to be viewed by an audience. As an audience development director, teaching artist, director, actor and more, how do you manage to find the time to take on another hobby? Because of my busy schedule, I just don't get to do pottery or any kind of hobby as often as I'd like to, but I force myself to squeeze in some time. Even though this art medium is not theatre, I always find myself inspired by it and I feel it only fuels my creativity and desire as an artist to create more art, regardless of whatever or wherever the “stage” may be! ART IS LIFE!